For a more challenging approach to Crockauns, also taking in 8 other neighbouring tops, a starting point is Doon Lough (794363 I). This allows a traverse of the range of hills framing Glencar to the south, from Leean Mountain in the east to Copes Mountain in the west. Smaller than the big lads to the north but every bit as beautiful, dramatic and exciting. Having camped on the summit of Keelogyboy SW Top I had a birds eye view across to the escarpment line that makes up Crockauns and Copes Mountains as early mist rose and dissapated under an April sun. An easy enough drop brought me down past the very shapely flanks of the Keelogyboys, contouring to the north below crags and patches of scree. A busy stream appeared out of nowhere and headed off on its merry way as i looked over Sligo Bay. Cross a sizeable area of level ground which looked like it would be pretty wet but was easy enough. This reaches an old track which peters out before an abandoned farm building and the road alluded to in other comments. The steep slopes and crags stand high above this lonely road and made a beautiful canvas. Crossed the fence at side of the road and climbed up steep cropped grass amongst sheep, lambs and wind sculpted trees. This was just to the right of prominent point 374m (768403 J) below a prominent crag line. 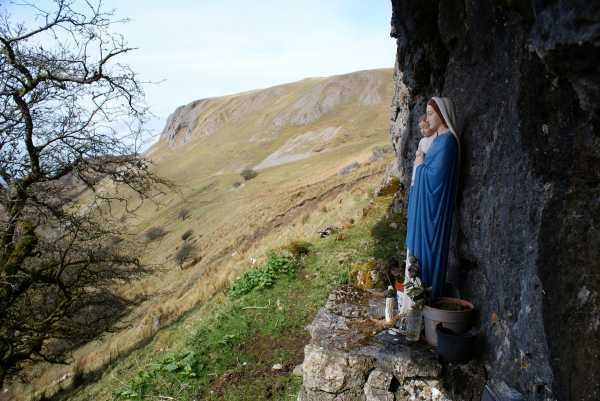 At this cragline came upon a little grotto with an alter, statue and plaque with a roof of rock overhanging providing shelter. A wild place and i am sure a memorable experience if present when mass celebrated. Continue to end of cragline and then uphill along a fenceline. Ravens were soaring above and landing on high points of rock as i passed remenants of the deep snow fall before Easter - some in the numerous sinkholes. Old stone walls and enclosures were being reclaimed by the land as i found the small cairn at the summit. Views were impressive to the high hills to the N, including Truskmore and Slievemore and down into the lough in Glencar. To the S & W views stretched into Atlantic and out along the coast to the Nephin Beg mountains, over Lough Gill and the other hills that i had walked over to get here. I continued on to Copes Mountain before the trek back to the car at Doon Lough.